Los Angeles, CA, November 21, 2017 –(PR.com)– Select works by David Hockney will be on view at the Jonathan Novak Contemporary Art gallery exhibit at Art Miami. David Hockney is regarded as one of the most influential artists of the twentieth century and a leading figure in the Pop Art movement. Hockney is known for his mastery of a wide range of mediums and styles. 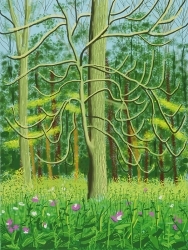 As a talented painter, printmaker, stage designer and photographer, a highlight of David Hockney’s work has been his unique and expanding depictions of the natural world. Novak has selected a lushly colored watercolor landscape from 2003 for the exhibit. Also on view are selections from Hockney’s more recent years, created by his newest choice medium for landscapes, the ipad drawing. These stunning landscapes are sublime compositions, continually fresh, celebrating the artist’s mastery of color and light. At Art Miami, Novak will also be exhibiting a diverse collection of paintings, drawings, sculpture, and editioned works by other renown artists of Abstract Expressionism, Pop, and Photorealism, including Sam Francis, Jim Dine, Wayne Thiebaud, Robert Motherwell, Alexander Calder, Howard Hodgkin, Ralph Goings, Jean Dubuffet, Alex Katz, Saul Steinberg, Julian Opie, Paul Jenkins and others. Since 1978, Jonathan Novak Contemporary Art has been an important source for Post-War and Contemporary American and European art. The current gallery location opened in 2000 and is located in the heart of Century City, adjacent to Beverly Hills and the west side of Los Angeles. The gallery’s extensive inventory includes paintings, drawings, sculpture, and prints by acclaimed artists from significant Post-War movements including Abstract Expressionism, Color Field, Minimalism, Pop Art, and Photorealism.